The grand idea is to start with an initial linear approximation for the value of the complex exponential eis near s = 0 (to be precise, we’ll use the eiε = 1 + iε formula) and then show how the ‘magic’ of i – through the i2 = –1 factor – gives us the sine and cosine functions. What we are going to do, basically, is to construct the sine and cosine functions algebraically. Let us, as a starting point – just to get us focused – graph (i) the real exponential function ex, i.e. the blue graph, and (ii) the real and imaginary part of the complex exponential function eix = cos(x) + isin(x), i.e. 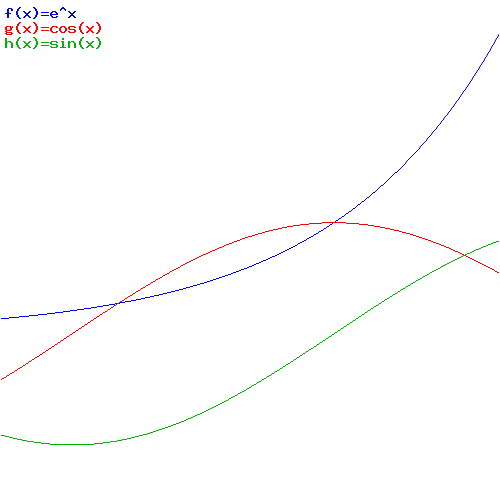 the red and green graph—the cosine and sine function. From these graphs, it’s clear that ex and eix are two very different beasts. Two different beasts, indeed. How can the addition of one tiny symbol – the little i in eix – can make such big difference? Of course, 1 + iε is also a different ‘beast’ than 1 + ε. 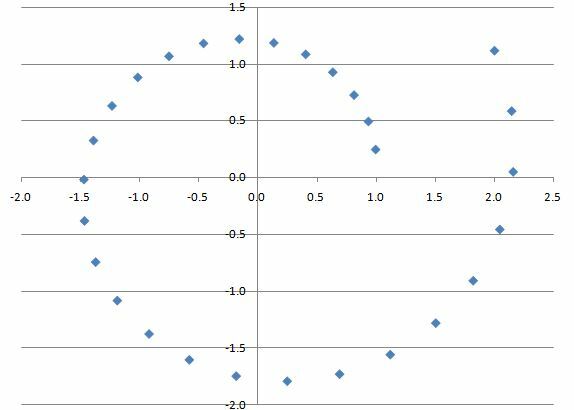 Indeed, 1 + ε is just a continuation of our usual walk along the real axis, but 1 + iε points in a different direction (see below). This post will show you where it’s headed. Let’s first work with ex again, and think about a value for ε. We could take any value, of course, like 0.1 or some fraction 1/n. We’ll use a fraction—for reasons that will become clear in a moment. So the question now is: what value should we use for n in that 1/n fraction? Well… Because we are going to use this approximation as the initial value in a series of calculations—be patient: I’ll explain in a moment—we’d like to have a sufficiently small fraction, so our subsequent calculations based on that initial value are not too far off. But what’s sufficiently small? Is it 1/10, or 1/100,000, or 1/10100? What gives us ‘good enough’ results? In fact, how do we define ‘good enough’? Good question! In order to try to define what’s ‘good enough’, I’ll turn the whole thing on its head. In the table below, I calculate backwards from e1 = e by taking successive square roots of e. Huh? What? Patience, please! Just go along with me for a while. First, I calculate e1/2, so our fraction ε, which I’ll just write as x, is equal to 1/2 here, so the approximation for e1/2 is 1 + 1/2 = 1.5. That’s off. How much? 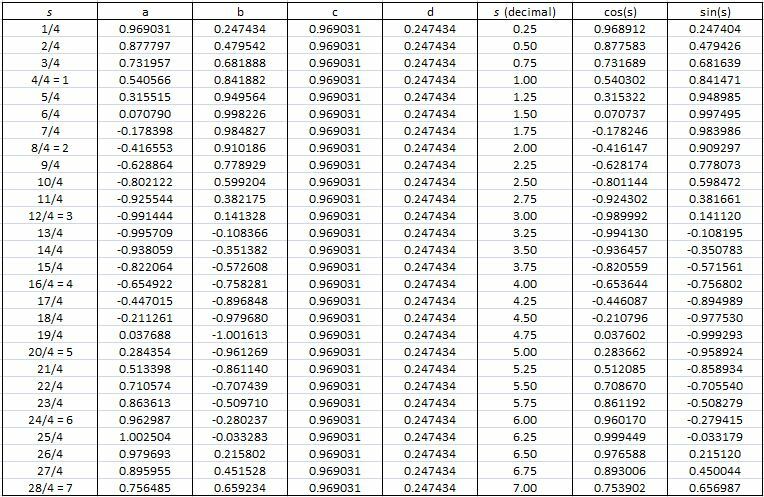 Well… The actual value of e1/2 is about 1.648721 (see the table below (or use a calculator or spreadsheet yourself): note that, because I copied the table from Excel, ex is shown as e^x). Now, 1.648721 is 1.5 + 0.148721, so our approximation (1.5) is about 9% off (as compared to the actual value). Not all that much, but let’s see how we can improve. Let’s take the square root once again: (e1/2)1/2 = e1/4, so x = 1/4. And then I do that again, so I get e1/8, and so on and so on. All the way down to x = 1/1024 = 1/210, so that’s ten iterations. 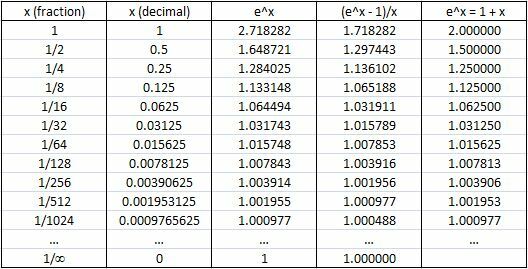 Our approximation 1 + x (see the fifth/last column in the table below is then equal to 1 + 1/1024 = 1 + 0.0009765625, which we rounded to 1.000977 in the table. The actual value of e1/1024 is also about 1.000977, as you can see in the third column of the table. Not exactly, of course, but… Well… The accuracy of our approximation here is six digits behind the decimal point, so that’s equivalent to one part in a millionth. That’s not bad, but is it ‘good enough’? Hmm… Let’s think about it, but let’s first calculate some other things. The fourth column in the table above calculates the slope of that AB line in the illustration above: its value converges to one, as we would expect, because that’s the slope of the tangent line at x = 0. [So that’s the value of the derivative of ex at x = 0. Just check it: dex/dx = ex, obviously, and e0 = 1.] Note that our 1 + x approximation also converges to 1—as it should! It’s quite obvious that 1 + i/1024 is a complex number: its real part is 1, and its imaginary part is 1/1024 = 0.0009765625. [It would be good to always separate the imaginary unit i from real numbers like a, b, or ab, but then I am lazy and so I hope you’ll always recognize that i is the imaginary unit.] In any case… When we’re going back up (by squaring), the real part of the next number (i.e. the ‘x’ in x + iy) is a2 – b2 and the complex part (the ‘y’) is 2abi. So that’s what’s shown below—in the fourth and fifth column, that is. Look at what happens. The x goes to zero and then becomes negative, and the y increases to one. Now, we went down from e1/n = e1 = e1/1 to e1/n = e1/1024, but we could have started with e2, or e4/n, or whatever. Hence, I should actually continue the calculations above so you can see what happens when s goes to 2, and then to 3, and then to 4, and so on and so on. What you’d see is that the value of the real and imaginary part of this complex exponential goes up and down between –1 and +1. You’d see both are periodic functions, like the sine and cosine functions, which I added in the last two columns of the table above. Now compare those a and b values (i.e. the second and third column) with the cosine and sine values (i.e. the last two columns). […] Do you see it? Do you see how close they are? Only a few parts in a million, indeed. You need to let this sink it for a while. And I’d recommend you make a spreadsheet yourself, so you really ‘get’ what’s going on here. It’s all there is to the so-called ‘magic’ of Euler’s formula. That simple (a + ib)2 = a2 – b2 + 2abi formula shows us why (and how) the real and imaginary part oscillate between –1 and +1, just like the cosine and sine function. In fact, the values are so close that it’s easy to understand what follows. They are the same—in the limit, of course. Indeed, these values a2 – b2 and 2ab, i.e. the real and imaginary part of the next complex number in our series, are what Feynman refers to as the algebraic cosine and sine functions, because we calculate them as (a + ib)2 = a2 – b2 + 2abi. These algebraic cosine and sine values are close to the real cosine and sine values, especially for small fractions s. Of course, there is a discrepancy becomes – when everything is said and done – we do carry a little error with us from the start, because we stopped at 1/n = 1/1024, before going back up. 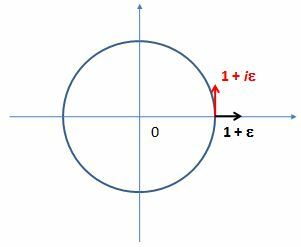 There’s actually a much more obvious way to appreciate the error: we know that e1/1024 should be some point on the unit circle itself. Therefore, we should not equate a with 1 if we have some value b > 0. Or – what amounts to saying the same – if if b is slightly bigger than 0, then a should be slightly smaller than 1. So the eiε ≈ 1 + iε is an approximation only. It cannot be exact for positive values of ε. It’s only exact when ε = 0. So we’re off—but not far off as you can see. In addition, you should note that the error becomes bigger and bigger for larger s. For example, in the line for s = 1, we calculated the values of the algebraic cosine and sine for s = 2 (see the a^2 – b^2 and 2ab column) as –0.416553 and 0.910186, but the actual values are cos(2) = –0.416146 and sin(2) = 0.909297, which shows our algebraic cosine and sine function is gradually losing accuracy indeed (we’re off like one part in a thousand here, instead of one part in a million). That’s what we’d expect, of course, as we’re multiplying the errors as we move ‘back up’. The graph below plots the values of the table. This graph also shows that, as we’re doubling our ratio r all the time, the data points are being spaced out more and more. This ‘spacing out’ gets a lot worse when further increasing s: from s = 1 (that’s the ‘highest’ point in the graph above), we’d go to s = 2, and then to s = 4, s = 8, etcetera. 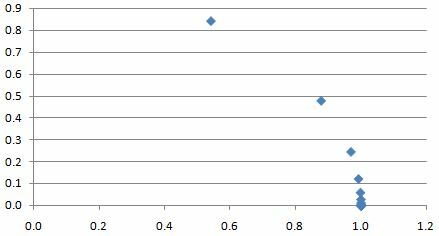 Now, these values are not shown above but you can imagine where they are: for s = 2, we’re somewhere in the second quadrant, for s = 4, we’re in the third, etcetera. So that does not make for a smooth graph. We need points in-between. So let’s ‘fix’ this problem by taking just one value for s out of the table (s = 1/4, for example) and we’ll continue to use that value as a multiplier. In the table above, I let s range from zero (0) to seven (7) in steps of 0.25 (= 1/4). Once again, I’ve added the real cosine and sine values for these angles (they are, of course, expressed in radians), because that’s what s is here: an angle, aka as the phase of the complex number. So you can compare. The table confirms, once again, that we’re slowly losing accuracy (we’re now 3 to 4 parts in a thousand off), but it is very slowly only indeed: we’d need to do many ‘loops’ around the center before we could actually see the difference on a graph. Hey! Let’s do a graph. [Excel is such a great tool, isn’t it?] 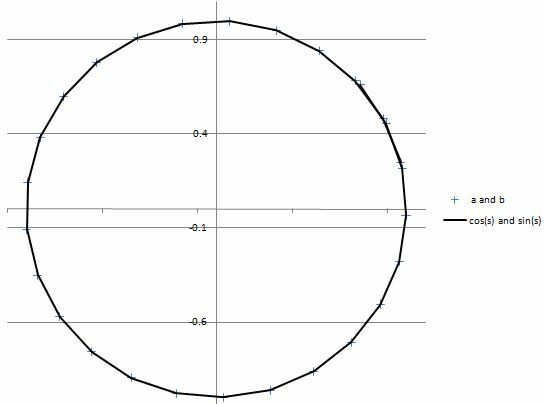 Here we are: the thick black line describing a circle on the graph below connects the actual cosine and sine values associated with an angle of 1/4, 1/2, 3/8 etcetera, all the way up to 7 (7 is about 2.3π, so we’re some 40 degrees past our original point after the ‘loop’), while the little ‘+‘ marks are the data points for the algebraic cosine and sine. They match perfectly because our eye cannot see the little discrepancy. So… That’s it. End of story. Yes. That’s it. End of story. I’ve done what I promised to do. I constructed the sine and cosine functions algebraically. No compass. 🙂 Just plain arithmetic, including one extra rule only: i2 = –1. That’s it. I. If anything, all this post did was to demonstrate multiplication of complex numbers. Indeed, when everything is said and done, exponentiation is repeated multiplication–both for real as well as for complex exponents. The only difference is–well… Complex exponents give us these oscillating things, because a complex exponent effectively throws a sine and cosine function in. Now, we can do all kinds of things with that. In this post, we constructed a circle without a compass. Now, that’s not as good as squaring the circle 🙂 but, still, it would have awed Pythagoras. Below, I construct a spiral doing the same kind of math: I start off with a complex number again but now it’s somewhat more off the unit circle (1 + 0.247434i). In fact, I took the same sine value as the one we had for ei/4 but I replaced the cosine value (0.969031) with 1 exactly). In other words, my ε is a lot bigger here. So you can see what happens: multiplying complex numbers amounts to adding angles and multiplying magnitudes: αeiβ·γeiδ = αγei(β+δ) =|αeiβ|·|γeiδ|ei(β+δ)| = |α||γ|ei(β+δ). So, because we started off with a complex number with magnitude slightly bigger than 1 (you calculate it using Pythagoras’ theorem: it’s 1.03, more or less, which is 3% off, as opposed less than one part in a million for the 1 + 0.000977i number), the next point is, of course, slightly off the unit circle too, and some more than 3% actually. And so that goes on and on and on and the ‘some more’ becomes bigger and bigger in the process. II. The other thing that I demonstrated in this post may seem to be trivial but I’ll emphasize it here because it helped me (not sure about you though) to understand the essence of real exponentials much better than I did before. So, what is it? Well… It’s that rather remarkable fact that calculating (real) irrational powers amounts to doing some infinite iteration. What do I mean with that? Well… Remember that we kept on taking the square root of e, so we calculated e1/2, and then (e1/2)1/2 = e1/4, and then (e1/4)1/2 = e1/8, and then we went on: e1/16, e1/32, e1/64, all the way down to e1/1024, where we stopped. That was 10 iterations only. However, it was clear we could go on and on and on, to find that limit we know so well: e1/Δ tends to 1 (not to zero (0), and not to e either!) for Δ → ∞. Still not convinced? Let’s revert back to base 10. We can write the factors e7.233784…/Δ as e(ln10·π)/Δ = [eln10]π/Δ = 10π/Δ. So our original power 10π is equal to: 10π = 10π/Δ·10π/Δ·10π/Δ·10π/Δ·10π/Δ·10π/Δ… = 10π(Δ/Δ), and of course, 101/Δ also tends to 1 as Δ goes to infinity (not to zero, and not to 10 either). 🙂 So, yes, we can do this for any real number a and for any r really. Again, this may look very trivial to the trained mathematical eye but, as a novice in Mathematical Wonderland, I felt I had to go through this to truly understand irrational powers. So it may or may not help you, depending on where you are in MW. III. So how does that ar = ar/Δ·ar/Δ·ar/Δ·ar/Δ… formula work for complex exponentials? We just add the i, so we write air but we know what effect that has: we have a different beast now. A complex-valued function of r, or… Well… If we keep the exponent fixed, then it’s a complex-valued function of a! Indeed, do remember we have a choice here (and two inverse functions as well!). A. The first interpretation is the easiest one: we write air as air = (ar)i = (ar/Δ + r/Δ + r/Δ + r/Δ +…)i. So we have a real power here, ar, and so that’s some real number, and then we raise it to the power i to create that new beast: a complex-valued function with two components, one imaginary and one real. And then we know how to relate these to the sine and cosine function: we just change the base to e and then we’re done. In fact, now that we’re here, let’s go all the way and do it. As mentioned in my previous post – it follows out of that as = (ek)s = eks = et formula, with k = ln(a) – the only effect of a change of base is a change of scale of the horizontal axis: the graph of as is fully identical to the graph of et indeed: we just we need to substitute s by t = ks = ln(a)·s. That’s all. So we actually have our ‘Euler formula for ais here. For example, for base 10, we have 10is = cos[ln(a)·s] + isin[ln(a)·s]. But let’s not get lost in the nitty-gritty here. The idea here is that we let i ‘act’ on ar, so to say. And then, of course, we can write ar as we want, but that doesn’t change the essence of what we’re dealing with. For rational r, we’ll have a finite number of complex factors: aim/n = ai/n·ai/n·ai/n·ai/n·… (m times). For irrational r, we’ll have an infinite number of complex factors air = air/Δ·air/Δ·air/Δ·air/Δ… etcetera. So the difference with the first interpretation is that, instead of looking at air as a real number ar that’s being raised to the complex power i, we’re looking at air as a complex number ai that’s being raised to the real power r. As said, the mathematical result when putting real numbers in for a and r will – obviously – have to be the same. [Otherwise we’d be in serious trouble of course: math is math. We can’t have the same thing being associated with two different results.] But, as said, we can effectively interpret air in two ways. What I am doing here, of course, is contemplating all kinds of mathematical operations here – including exponentiation – on the complex space, rather on the real space. So the first step is to raise a complex number to a real power (as opposed to raising a real number to a complex power). The next step will be to raise a complex number to a complex power. So then we’re talking complex-valued functions of complex variables. Now, that’s what complex analysis is all about, and I’ve written very extensively about that in my October-November 2013 post. So I would encourage you to re-read those, now that you’ve got, hopefully, a bit more of an ‘intuitive’ understanding of complex numbers with the background given in this and my previous post. This entry was posted in Mathematics and tagged algebraic cosine, algebraic sine, analytic functions, Complex analysis, complex exponentiation, complex mappings, complex numbers, Euler's formula, math for dummies, Road to Reality, Roger Penrose, squaring the circle. Bookmark the permalink. I hate to break it to you, but your starting math looks wrong to me. Your approximation for e^x is e^x = 1 + x. Then e^(i*s) = 1 + i*s. We can get this by substituting “i*s” in place of “x” in the first formula. That’s fine, and that’s what you have. You then set up a complex number a + i*b, which you say is the approximation 1 + i*s of the formula e^(i*s) = 1 + i*s. But then, in order to increase s, you square it. What does this do to the approximation a + i*b? You think that it squares the entire thing: (a + i·b)^2. However, it doesn’t because of substitution rules: e^c = 1 + c, so e^2c = 1 + 2c, and e^3c = 1 + 3c, and so on, and thus e^i*s = 1 + i*s and e^(2*i*s) = 1 + (2*i*s). Yes, this may not look like the original variables usage to you, but that’s because you mixed them up. And sadly the error propagates itself into the rest of the math.